slate covers library extinction, architecture. As the title “Borrowed Time: How Do You Build a Public Library in the Age of Google?” might suggest, the author is skeptical of recent efforts to recreate central public libraries as the physical embodiment of 19th to mid 20th century civic idealism, judging that while “retro ballparks have enjoyed success with the public… I’m not sure that trying to re-create the library-as-monument has an equal appeal.” Instead, he praises the approach of Seattle and Salt Lake City to fashion new libraries with a more urban and contemporary allocation of space and technology. Jenny Levine points out that this essay focuses almost completely on the physical space libraries occupy, completely ignoring the web as an aspect of our services. Frustrating as it may be, this is a persistent symptom of public opinion and press coverage of libraries in general. While we scramble to redefine ourselves and transform old services using new models, most people still think of libraries as they have existed physically for so long – buildings and books – and will likely continue to do so, with incremental change, for the forseeable future. 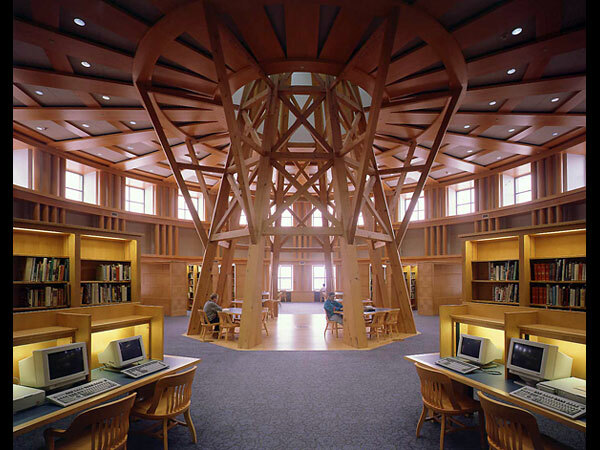 Library buildings are culturally powerful as physical spaces, and ones that most people maintain strong connections/aversions to and memories of throughout their lifetimes, which I believe is one reason our attempts at “rebranding” have to date been so difficult. As such, libraries of all kinds have become choice targets for sweeping predictions about radical cultural change brought about by social digitization – we remain fixed in place, conservative, and traditional in the minds of most, despite plenty of (well-concealed?) evidence to the contrary. I just wish that we were credited for our undeniable staying power as sitting ducks a bit more often. kindle meets the 21st century.